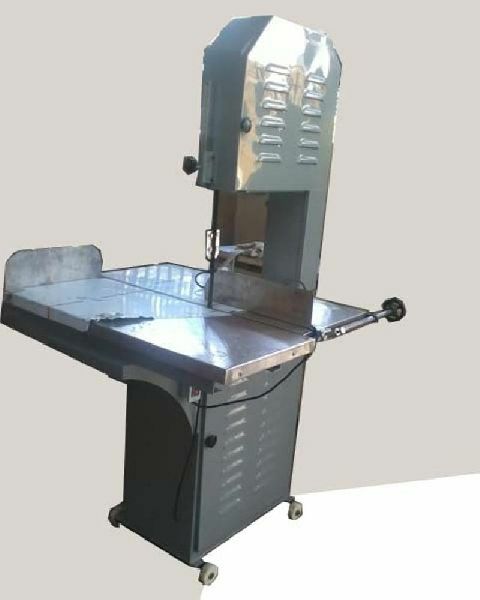 Meat & Bone Cutting Machine: The Machine Useful for preparing specimen of big size in anatomy and meat departments. It’s fitted with large moving table and extension table operated on four ball-bearing rollers. Used extensively in the meat packing, and wholesale fish industry, for handling sword fish and large halibuts etc. The table is made of thick S.S. sheet with special heavy axles for easy and firm movement. Supplied complete with on blade, starter, cord and plug 1.5Hp motor for 18” & 3Hp for 24” works on 220V, single phase, 50Hz, AC Supply. Branded make (Crompton) motor provided in machine on request. Meat & Bone Cutting Machine: The basic Band saw cutting machine is very useful for small meat cuttings on single table like human body specimen, chicken & fish etc. the machine is used without sliding table.